EZBIS offers chiropractic software for billing, scheduling and electronic health records. They provide powerful features for practice automation including patient self-check-in, online patient portal, internet patient intake forms and auto-posting of insurance payments. EZBIS is ICD-10 ready and ONC-certified for the 2014 Edition of the Meaningful Use EHR program. E-Z BIS, Inc. one of the nation's foremost manufacturers of comprehensive, custom featured chiropractic software, has been developing and marketing software that is specific to the chiropractic industry since 1980. 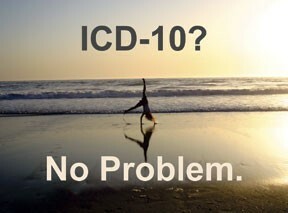 The latest EZBIS version 10.4 fully supports ICD-10, including the ability to dual-code for both ICD-9 and ICD-10, automatic transitioning of codes on and back-billing using ICD-9. An exclusive ICD-10 Wizard helps doctors to choose the appropriate ICD-10 diagnosis codes, based on the existing ICD-9 diagnosis. Plus, there is new support for "Insurance Payment Cards" which are sometimes called "virtual credit cards" issued by insurance companies as payment for claims instead of mailing checks or depositing EFTs. Learn about the latest features in EZBIS and how to take advantage of many time-saving capabilities that you may not know about. They constantly enhance their programs and distribute updates to their clients. They know that their customers are their best resource for discovering new ways to improve office efficiency. EZBIS offers a complete range of options for billing, scheduling and certified electronic health records, as well as training seminars. Peruse their website to learn more about all that they have to offer.